From why you should avoid certain skin triggers to emergency pimple-vanishing plans, we've compiled a cheat sheet on everything you need to know to get perfect wedding day skin. So if you're currently in the lead up to your big day (or you just appreciate really good skin), add this post to your bookmarks. Keep reading for Hobson's professional advice. Whether you have persistent acne or only suffer with the occasional spot, no one wants to wake up to a pimple on their wedding day. According to Hobson, how you approach treatment, and when you start, should depend on the nature of your breakouts. "If it's severe, I really think it’s a trip to the doctor that’s going to help you", says Hobson. Prescription medications can help, but salon treatments are another worthy option. "LED is great—blue light is fantastic for clearing up breakouts," Hobson explains. (Read more about LED light therapy here.) If your condition is chronic, Emma recommends starting a treatment plan (including a targeted at-home routine) at least "ten to twelve weeks" prior to your wedding day. If you don't deal with acne on the daily, but still live in fear you'll discover a huge spot the day before, Hobson's emergency plan might help you relax. First off, don't squeeze: "I know it’s tempting, but don’t do it." Not only can you actually make the blemish worse, you'll create an open wound in the skin—something that's difficult to hide with makeup. 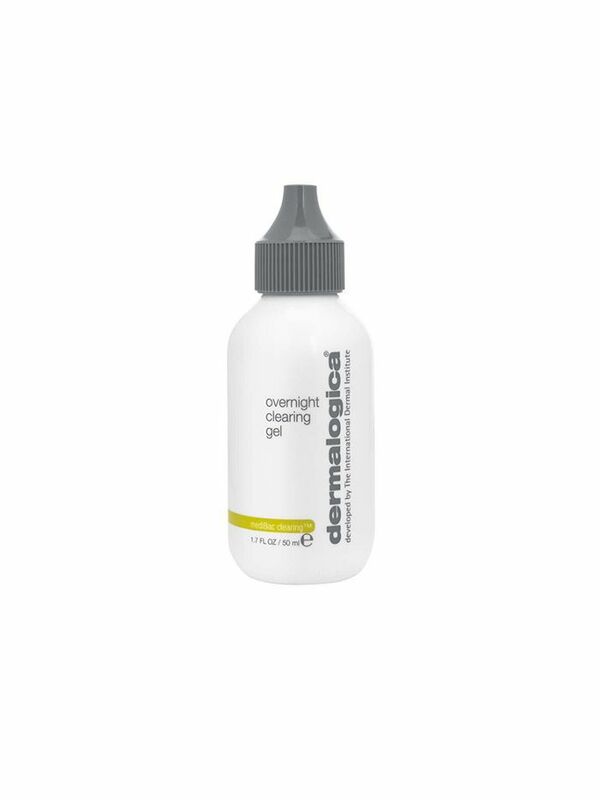 Next, you'll want to apply an overnight spot treatment like Dermalogica's Clearing Gel ($71). "When you wake up in the morning, you’ll be so grateful because the inflammation will have gone down. The spot will possibly still be there, but it will be so much easier to hide," says Hobson. Noted. The first thing you can do if you're dealing with rosacea is to look at your lifestyle for potential inflammatory factors. "There are things that are triggers [for the condition], and alcohol is one of them," says Hobson. So, as hard as it may be, in order to mitigate redness you might need to save the bubbles for your big day. According to Hobson: "Spicy food is probably a trigger for a lot of people, tomatoes surprisingly can cause flare ups for some too. Dairy also can for some, but not everybody." It also pays to cover up in the sun—especially if you're getting hitched OS. If managing triggers isn't enough, Hobson again recommends LED light therapy, this time using a healing red light. Not quite as serious as the above, maybe, but considering many longwear lipstick formulas are already drying, going into your wedding day makeup with flaky lips can be a disaster. If Hobson can offer you one piece of preventative advice, it would be to up your water intake to prevent dehydration. Also? Exfoliate. "The Dermalogica Daily Microfoliant ($70) is a skin polisher [but] it's a rice bran powder and it's so gentle so you can use it on the lips. Mix it into a paste, massage it around, and it makes the lips super, super smooth. And then, put a balm on." Making these steps a part of your weekly skincare routine is often enough to ensure your lips are in good shape on the big day. For many more tips (including which active ingredients to use instead of retinol if you're pregnant) watch the full video interview with Hobson below.